Can you update us on your future development plans since the last Q&A? We’ve been working hard on getting new content and features into the game on a regular basis. The second phase of the PVP revamp has launched and we’ve made efforts to handle cheaters. - As of 01.06.2012, ability to drop weapons, gadgets not earned or released in the game was stopped. On 15.06.2012 - all 'Not Tuned' items were removed from PvP but leaving earlier Hacked Gold items i.e. Heroic Calls with 900+ PvP Bonuses untouched'. We are working on “Phase Three” now - increasing the long term competitive gameplay and rewards of PVP - stay tuned for more information coming soon! We’ve made good progress increasing the stability of our game, but we still have work left to do - we have more fixes on the way to safeguard against players losing progress in the game. Thanks for your continued patience and support! Chapter 8 is live, and Chapter 9 is coming soon. We are also working on the next Spec Op mission. We learned a lot from the first Spec Op, and we are working hard to make sure it is a super-fun experience for all players and we’re keeping a careful eye on the balance and plan to greatly improve the rewards along the way. 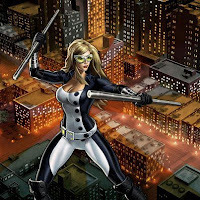 - If our sources are correct, 16.07.2012 will release the next Spec Ops #2 with Emma Frost. Subject to change. We have a bunch of new heroes and costumes running, flying, and teleporting their way to the game very soon! Some classics and some fan favorites will be announced shortly at San Deigo Comic Con. Do you plan to add more different Hero team up bonuses, such as Black Panther and Storm, in the future? Yes, we really enjoy showing off classic Marvel teams and character interactions in the game. We’re looking over the roster of characters and plan to add more of these in the future. - For now Playdom is re-introducing buffs and passives into its existing and new range of costumes and suits. So far - Ironman, Kitty Pryde, Colossus, Black Cat, Spiderman etc. had been boosted. Are there any plans to develop any additional game modes? We are always looking into ways to improve the game. We have a few big, exciting new features planned before the end of the year. Stay tuned for more info. Are there plans to add a feature to upgrade weapons so the weapon matches Agent’s current level? We have been looking into this, but are focusing on continuing to add new and different weapons to the game to give people rewards to strive for and add further variety and visual differentiation. Will we be able to port our current character to the new version on playdom.com? This is not currently planned. We encourage Facebook players who want to play on playdom.com as well to start fresh, try different heroes and strategies, and also take advantage of the features unique to the playdom.com version. In PVP, is there any way we can preview the opponent’s team so you can put up your best against their best? The asymmetrical nature of the PVP class system would mean that your opponent would always be at a disadvantage. We think that not knowing who your opponent is or their capabilities adds to the challenge, and to the fun. I would love to see replays of PvP matches other players initiated. We have been looking into this idea. It would be really cool to allow players to share replays. It’s something we’re looking at but want to focus on some of our upcoming releases first - like continued improvements to PVP gameplay and rewards and our upcoming Chapters and Spec Ops missions. Are there plans to release more female heroes, particularly a 90 CP female hero? (Player comment: If so, can you please not introduce her via a scenario where she needs to be rescued. I hate putting Mockingbird into the same category as Daphne (Scooby Doo)).Yes! - The current guess points to ROGUE. Possibily will be priced similarly to Black Panther, Scarlet Witch @ 90CP. SO brings boosts to a Hero's stats, but will they be further customization for Heroes? Like being able to put skill points to amplify certain abilities and their effectiveness, helping to make character builds per Hero more unique? We are looking into ways to continue to customize your heroes. In the meantime, we want to make sure that the different heroes can work together in interesting ways, and that players have lots of meaningful choices and strategies when recruiting and assembling their strike team. We are also looking into adding additional power progression for the Heroes and the Agent in the future. Instead of purchasing new outfits with specific ability sets on them, could we purchase "kits" that housed the buffs/abilities/different classes and then put it onto a uniform we want? We have been discussing the possibility of this. For now we’ve decided to place passive buffs and abilities on Agent Gear that can be equipped. Will you look at allowing us to have customized headquarters? This is not planned for the immediate future. We think this is a very cool idea, but we feel we have a lot of really exciting new things on the horizon in terms of new Heroes, Agent items, and mission and PVP gameplay improvements. We’re tackling those first, but it’s possible that we’ll have something cool in store for the Flight Deck in the future. Can you tell us how points and XP are awarded? XP is awarded based on the enemies you face. Each enemy has a set amount they will reward when they are defeated. If you are higher level than that enemy, you’ll get less XP - it scales to the challenge you are facing. You get 1/4th of the XP when you lose a fight. You should be able to see how points are awarded if you look at the score details after a fight. The base score is calculated from enemies defeated, how fast you defeated them, how much health your team has left, and any special bonuses like team bonuses or overkill bonuses. Then we apply multipliers based on combat difficulty and survival. Will there ever be some type of option to know the level of the ally before adding them? Not at the moment, but we have done our best to make it easy to add and remove allies using the “Allies” tab at the top of the app. Will the Mockingbird Spec Ops be available again in the future for players who start the game later? Have you considered having Spec Ops always be available and allow the timer to start only when the mission is activated? Right now, we have no plans to make Spec Op 1: “Don’t Say a Word...” available again. We will be releasing new Spec Ops missions on a regular basis though. Look for our next Spec Op mission very soon! Development process What are your priorities for future development? Before we answer that, understand that our roadmap of features extends well beyond the next six months. Any new features or content are competing for development time and while we would love to get many of these suggestions implemented, we have to be careful of the order and the timing. We’re working hard to get updates out and respond to feedback from the community. We appreciate your continued feedback and patience. How do you decide who or what to buff or nerf? We try to look for when a character, weapon, or class becomes dramatically overused or underused. Usually this indicates that there’s something wrong with that character or some systemic problem that is holding them back, such as a strong metagame. For instance, when Tacticians are strong, Blasters naturally suffer. We also know from playing ourselves when certain characters fall behind and need a little love to bring them back into the game. We’re looking at Thing and Nightcrawler right now. Do you test new values internally before releasing them to the community? We test new changes extensively. Of course, this can’t compare to the millions of industrious players looking for new ways to best use these changes. How much do forum suggestions or complaints factor into design decisions? The forums are a good way to get a finger on the pulse of the player base. The players participating on the forums are always very passionate about the game and this often leads to great feedback and insights. Could you give more warning on upcoming game changes or maintenance, and provide more release notes after changes? We understand how unannounced updates can be frustrating to players, especially when they don’t know what changes are included in the updates. To this end, we are trying to improve our process for getting out comprehensive and timely patch notes as best we can. Player vs. Player What is the future of PVP? PVP is an area that we are always looking to improve. We know that PVP can be a great way to play the game, but we understand we have much room for improvement to make it more fair and competitive. We are not currently satisfied with the ladder system, matchmaking, or AI. We are also looking into a Tournament feature with big prizes. Before we do that, there are some issues with our combat system that we are working hard to address. Will there ever be “live” or “real-time” PVP? This is one of the many improvements to PVP we are investigating. n the short term, we are going to reward players much more experience points for the first few PVP battles they do each day. This is to encourage players to participate some each day without it becoming a grind. In the long term, we plan to have significant rewards for our best PVPers when we release Tournaments. We will release more information as this feature draws closer. Will you ever be able to use 3 heroes in PVP? The short answer is no. We know that players feel particularly tied to their Agent and want to make sure that all the work players put in to leveling up and properly equipping gear for their Agent never gets diminished. In early pre-release versions of Avengers Alliance, we allowed hero-only teams, but it did not feel as rewarding. This is an interesting idea. We will consider it in the context of future PVP changes. Heroes and Villains Which new heroes will you be adding? We have many heroes coming soon, both in Special Operations and permanently available for purchase. The next hero coming soon is Black Panther! How do you decide which new heroes to add? Seriously, though, there are many considerations including the character’s popularity and prominence, as well as the direction of our ongoing story. While we launched with the flagship characters, we definitely have plans for some niche characters and many more fan favorites going forward. Will Deadpool be in the game at some point? We will if the little yellow boxes over our head tell us we can. Will there be additional Villains in the future? Yes! In future Missions and Spec Ops, you may find your Agent facing off against the likes of Red Skull, Sauron, and Kang the Conquerer, to name a few. Will you ever be able to play as a villain? S.H.I.E.L.D. has been known to institute rehabilitation programs. We are definitely looking into the possibilities here. Will heroes be able to train past level 12 or gain new moves not yet available in the game? This is one of the features on our roadmap we are pursuing but do not have an ETA at this point. The Agent and Items Will there be more ways to customize your Agent? We are always trying to diversify the available gear to provide more options for players to express themselves through gameplay choices. We are also considering more options for purely aesthetic customizations for your Agent. Do you have plans to scale rewards by level? We recently introduced “Customized” weapons, which scale to your level when you get them. This makes these weapons useful to any player that acquires them. This property will appear on Limited Edition items and rewards from Special Operations. Will the Agents get more uniforms? We definitely plan for more in the future, but we’re deciding the best way to make them feel special. Will the Agent get additional weapon slots? We will look into this. However, the constraint of choosing which weapons to bring to combat is an interesting choice players have to make in the game. Will there be different kinds of Iso-8? We are definitely looking at our options here to make Iso-8 more diversified and have additional gameplay effects. Will there be class-specific weapons for the Agent? It’s an interesting idea. We’ll consider it. What does P.E.W., S.A., and A.R. stand for? Game Mechanics Is there a max level? Currently no player is close to the technical level cap. This can always grow as we need it to. Does status effect damage scale with level? Most status effects from weapons or Hero abilities scale with the level of the target that the status is applied to. For instance, using Bleeding on an enemy of a higher level will result in more damage over time than against one of a lower level. Similarly, if you use “Teresing Boost” to gain a heal over time, the amount will be in proportion to your own level. Can you show the exact % increase on status effects like Strengthened? This is possible but sometimes misleading, and can result in more confusion than clarity. The way that multiple stacking effects interact with each other is something we can’t easily communicate without blowing up in-game tooltips with information overload. When we have to choose, we usually prefer the more concise description. Will there be any future changes to class balancing? Yes, we have some ideas that should bring the classes more in line with each other and make class decisions more meaningful. We will release more information about this as these changes draw closer. Are there any plans to increase max energy? Are there plans for a “do not show again” option for the maxed out XP reminder? Yes. This is on the roadmap for a future release. Will you add the ability to train more than one hero at a time? We think that the difficult choices around how to use Heroes makes the game more interesting. Deciding who to bring, who to deploy, who to train, and who to send on the flight deck is part of the game. These choices reflect upon what kind of team the player wants to make. Keep in mind, that these restrictions don’t apply to PVP, where your Heroes are always available. Could you add a “Collect all” or “Resend all” option for the flight deck? We already have a “Collect All” option. We have considered adding “Resend All” in the past, but want to encourage players to use their heroes carefully and balance between mission and training needs. Mission and Story Will there be more than 10 chapters? Definitely! We are working hard on new Chapters and new Spec Ops right now. Look forward to Chapter 8 soon. Who is the man behind the dialogue? Most of the writing in the game is from our lead writer, Alex Irvine, a Marvel writer who has produced such works as “Daredevil Noir” and novelizations of the Iron Man films. Thank him for the witty quips. Social and Gifting Will there ever be an in-game message or chat system? We do not have plans for this, but we encourage players to discuss the game on the forums. Are there any plans to improve the Visit Allies feature? We have several social feature improvements on the roadmap. The next one to launch is the ability to challenge friends to casual, unrated PVP matches. Will you add the ability to sort gifts by type? Good idea, we will look into it. Will you add the ability to send return gifts even after hitting the gift cap? This is a wonderful idea and we will consider the feasibility of this feature. Are there any plans for cooperative raids? This feature is currently not on our roadmap, but we are investigating it. Miscellaneous Will players ever be able to reset an account or start a new character on the same one? We do not have any plans to allow players to reset an active account. For those who are interested in playing a new character from the beginning or new players without a Facebook account, we will soon unveil a version of Marvel: Avengers Alliance that can be played on Playdom.com. Stay tuned for more information on when this version of the game will be live. Are there any plans for an achievement system? We love achievements and want to give players another way to engage with our content to earn rewards for time and effort spent in the game. Many achievements in the game are already tracked in Marvel XP, a cross-game hub for the Marvel Gaming Universe. You can access this information by clicking the Marvel XP button above the game app and signing up. Will there be more Avengers movie tie-ins? We recently released Coulson’s Revenge, a weapon that was featured in a prominent scene from the movie. We also released a delicious, giftable item some people might recognize. Do you plan to improve your sound effects? We are planning to make some improvements here soon. Do you plan to have a “light” animation setting to reduce loading issues? This could be one of two different issues: long load times (with the loading widget, such as pre-combat) and the speed that animations play out in combat. Load times are not necessarily tied to the animations. We’re always looking for ways to streamline our game and reduce load times. As for speeding up combat animations, we are aware of player concerns and looking into ways to speed up combat globally rather than having an option to turn animations off. can the agent get another weapon slot ?? please give mocking bird back please!!!!!!!!!!! go to the hell, those sucker bartard playdumb !! they make game become extremely unbalace because of gold!!! im having problems with special ops mission 1. to unlock mission 2 it says to do 3 tasks in all hallows to unlock the second quest i have done 5-6 now and it still says i need to do another 3 can anyone help me sort this out plz?? What the hell? been playing for almost 40 times now in one particular chapter to get the weapon..and when im about to click it to get it refreshed problem came up..that happened to me 3 times now..was is that because i don't purchase gold that's why i don't need to get better weapon? i can't set iso into marvel heros slot plz...ans me..
can the agent get another weapon slot ? How many allies can be added. where is any "avengers weapon" ??? I'm stuck in the mission of Magneto (Chapter 11 - Mission 5 - Mutation Zone). The icon "Exit Map" is not clickable. Someone had the same problem? Combat Validation Problem is the worst thing that can happen to you especially when fighting epic bosses in Spec Ops. It feels like the your whole just crashed. So much effort and resources all gone for nothing. I can't use my iso-8 gems is there anyway that this can be fixed? i m on87 level... i want to ask that since 4 days i cant excess any fight in pvp or in missions.... why? it loads till 99 and than shows to be processing but does not.... i have waited 20 min for its completion but no positive results ..... why is this happening? Please give tips to earn many silver, I have to train my heroes. which Iron man Mk 42 armour is better??????? how can I research Target painter ? S.H.I.E.L.D. AlertHeads up Agent! S.H.I.E.L.D. is running critical diagnostics on all Helicarrier sub-systems. Check back soon and we will get you back in the fight. How do you win the premium characters for free like Mr Fantastic? magnetic boxes can unlock again or what i need to buy magneto ? thanks for this game ; my question is : why phoenix can't resist the fire ? why the hell don't you stop wasting people's time with the duplicate yielding lockboxes? I've wasted enough time trying to get them and couldn't unlock the last few heroes. Now it's about to be the same thing again. Need help with quest "minor threat" chapter 1 - excalibur defeat 2 mini-bosses. FIX PVP BUGS, A LOT OF PEOPLE HAVE 0 ATTACKS AND THEY ARE IN TOP TEN, FIX BUG WITH SCRAPERS ABILITY CLOSE QUARTERS COMBAT, ESPECIALLY WITH OMEGA SENTINEL, WHEN SHE ATTACK INFILTRATOR WITH PLASMA TORRCH, SHE DON'T USE DOUBLE ATTACK IN SHE'S SECOND TURN, FIX BUG WITH PHOENIX'S ABILITY PHOENIX FIRE, FIX BUG WITH STORM'S ABILITY STATIC CHARGE... THIS GAME IS GOING TO BE S...T !!! I get 1000 UNSTABLEISO 8 first day when i get the Day-Bonus but when i play Special OP i don't have 1000 more, there are only 450 like normal, is there some Problem or what ? im unable to get the blueprint of prototype cube from another univers how can i get it now?